Bangalore is reckoned as one of the most fastest growing cosmopolitan city. It is quite obvious that you would bump into IT-ites every now and then. Whether you are driving by the Silicon Valley or hopping into fancy places for a good brunch, the diversity of crowds here will never fail to impress you. The city undeniably screams technology. However, little do people realize that Bangalore is much more than just IT. It is also famous as the garden city. The place is blessed with abundance of flora and fauna. What certainly demands gratitude is the government’s efforts in keeping up with adequate maintenance of these beautiful gardens. Planned by looking into the nitty-gritties, you will only be awe-inspired when you drop by these gardens. The “Silicon Valley” is replete with gardens and parks. Whether you are looking to sit back and soak up the serenity of mesmerizing gardens or simply wish to jog for a fitter and blooming body, your options are quite big in number. As a newbie hanging hats in the city, the options might appear overwhelming. Muddled up thinking where to plan a visit first? Well, here’s a curated list of some of the best gardens to explore in Bangalore. Lalbagh Botanical Garden – Picking up this name from the localites staying here is very much expected. Well, the magnificence of this garden has attracted masses for years now. Lush green stretches, paired with plethora of floral varieties is bound to keep you enchanted. Are you curious to learn about the most exciting feature of this park? Well, some say that the place is styled in accordance with the Mughal Garden of South India. However, the most fascinating aspect of the park is that it is a dwelling house of more than 1000 varieties of flowers. Long bushy trees, vibrant flowers all the way, bamboo barks bedecking the place and constant chirping of birds – needless to say, you are certainly in for a visual treat in this picturesque garden. 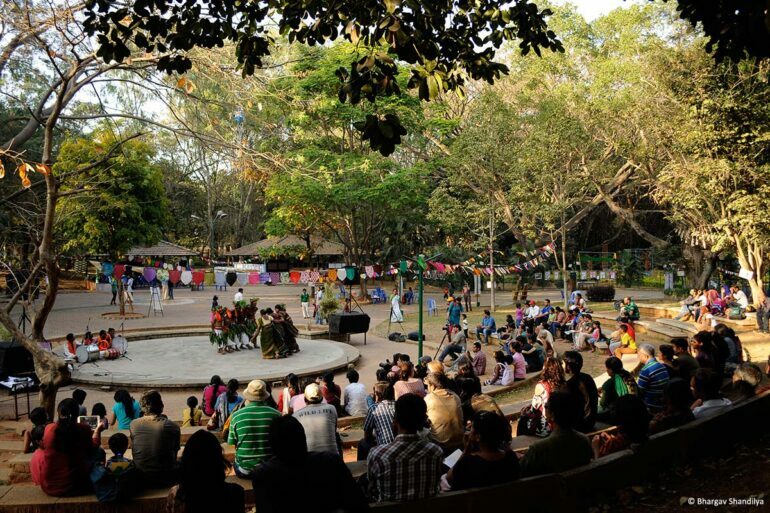 Cariappa Memorial Park – The abundant 22 acres park is undeniably a popular tourist spot. Created in the memory of K.M. Cariappa, a field marshall belonging to the state of Karnataka, the park is certainly reckoned as a crowd-favorite for weekend fun. What distinguishes it from being just a normal park is its careful and strategic planning. Ofcourse it is a paradise for nature lovers with a wide variety of trees shooting up alongside the joggers track and beautifully cropped flowers. The park is overall differentiated into six major sections. There’s an amusement arena for children, a lavish food court to fulfill your hunger pans, a cutting-edge entertainment zone, walkers track and so on. A beautifully designed waterfall in the garden draws in attention of visitors by large. Bugle Rock Park – Located on the Bull Temple road, this place draws fame as one of the most exquisite rock parks in Bangalore. The jagged rocks here make up for the beauty of this place. Apart from the diversity of flora and fauna that is commonly found here, this park is home to the famous Nandikesha and Ganapathi temple. There’s an amphitheater hosting events for the entertainment of visitors. Seeking for relaxing ‘ME’ time? Visit any of these best-in-class parks and fill your heart with joy and your mind with peace. Congress Version Of India’s History to be Rewritten In Bold!